Colaco said: “We are key players in feeding Nigerians; for us, this is a privilege and a responsibility that we are fully committed to. Of course, this initiative is fully linked with the pillar of our mission statement which addresses issues of nutrient security. Also speaking at the event, Professor of Community Health Nutrition and Nutrition Consultant, Ladoke Akintola University of Technology (LAUTECH), Ogbomosho, Oyo State, Ebenezer Ojefitimi, in his presentation titled, “The Role of Dairy in Promoting Nutrition: A Public Health Perspective, “ highlighted the significant benefits of quality nutrition in preventing issues of malnutrition across all life stages and economic groups. According to Ojefitimi, “Dairy and its products should be endorsed as an integral component of health patterns. After all, they are nutritionally beneficial, environmentally sustainable, economically viable and culturally acceptable. Dairy and its products have the potential to assist us to achieve our No 4 and 5 Millennium Development Goals (MDDs). Also present at the event was the Corporate Affairs Director for FrieslandCampinaWamco, Ore Famurewa. She said that ‘Peak Wazobia’ was introduced to make “Rich and Creamy Peak’ evaporated milk accessible to all Nigerians. “Whether we live in towns or villages, or we work in offices or study in schools, North or South, East or West, we all need complete and quality nutrition. That is the Wazobia story; accessibility to quality nutrition,” Famurewa added. 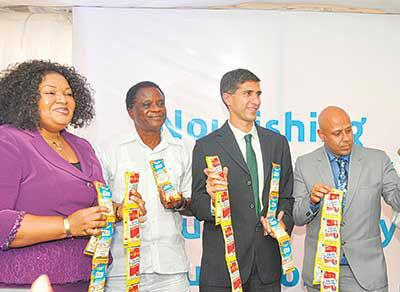 With the market launch of Peak Wazobia pack, FrieslandCampina Wamco is presenting a basket of low unit single serve packs at affordable prices, Famurewa noted. Other low unit portion packs unveiled by the company includes: Three Crowns Powder, N20;Three Crowns Evaporated milk in satchet,N25; Peak evaporated milk in sachet, N30; Peak Choco, N39; Peak Powdered milk, N35; New Three Crowns LUPP, N40; Peak Wazobia LUPP,N50 and Peak Fristi Vanilla flavoured milk, N10.